Hugh Latimer was the son of a yeoman farmer. 1510: Elected a Fellow of Clare College, Cambridge. 1512: Hugh Latimer ordained as a priest. 1522: Appointed a University Preacher at Cambridge and converted thereafter to Protestantism. 1534: Defended King Henry the Eight’s divorce from Catherine of Aragon. 1535: He was made Chaplain to Anne Boleyn and Rector of West Kington in Wiltshire. Created Bishop of Worcester. 1536: Resigned his See after the passing of the King’s “Six Articles”. Effectively imprisoned until the death of the King and the accession of his son facing actual prison in 1546. 1539: At the opening of the Convocation he preached powerfully in favour of the Reformation. 1547: Accession of King Edward the Sixth. Hugh Latimer was released but continued to preach against the many abuses of the church and clergy as he saw them. His sermons were noted for their vivid deliveries. 1553: After the accession of the Roman Catholic Queen Mary the First he declined to defend himself against a trial and also refused to recant his Protestantism. After the show trial he was burnt at the stake with his fellow martyr Nicholas Ridley. 1548: “A Notable Sermon Preached at St. Paul’s Cathedral”. 1549: “Seven Sermons Preached before the King”. 16th October 1555. 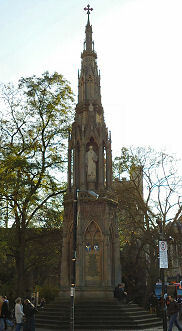 Burned at the stake next to Balliol College, Oxford, England. Ashes scattered at site of execution. 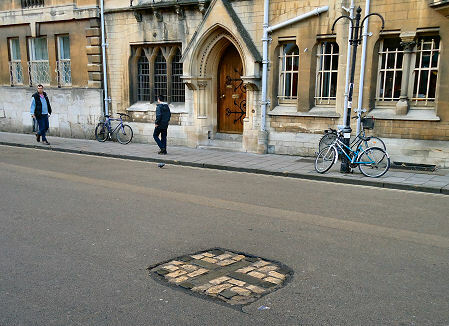 Cross marking the spot in Broad Street, Oxford where Latimer and Ridley were burnt at the stake.